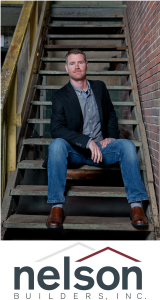 Meet Josh Nelson of Josh Nelson Builders. Josh came to the Remodeling Show in Chicago in 2015 and heard me speak. We set-up a complimentary coaching call the week after the show and had a great conversation. What Josh was looking for was a perfect fit for my coaching services. We also quickly connected from a personal standpoint – we had a lot of similarities in our lives outside of work and our desire to not just be good businessmen, but also our desire to be solid husbands, dads, and men of faith. I remember telling him what my coaching services would cost and how we would work together and he immediately said, “Let’s get started!” “Darn it,” I thought. Should have charged him more! Don’t you have that thought when you present to a remodeling prospect and they quickly say yes? During our coaching work we put a plan together to hire an office manager which was a huge key to his being able to delegate and work a more manageable number of hours. It was scary for him at the time, but such a tremendous help once in place. He moved his office out of the home to an office space at that time as well. We transformed his sales process and how he stays in touch with his previous clients. In Remodelers Circle, Josh has learned a tremendous amount from his peers. He developed relationships with everyone in the group by having a giving heart. He shares ideas, thinking about them and their business and gives them insight/feedback, encourages and holds his fellow Circle members accountable to the goals they set. He’s been a tremendous asset to the two Remodelers Circle groups he’s been a part of. “Kyle has helped me transform my business and the way I look at my business. If you look at any area of my business – you’ll see, through the work Kyle and I have done together, betters systems, organization, higher profitability, clarity on financials, a powerful and transformed sales process and follow-up system, a solid marketing plan and message, and so much more. We discuss life outside of work and he helps me keep the proper perspective on things. He even, without him realizing it, inspired me to start swimming several years ago – which I continue to do today and that has helped my health tremendously. Before working with Kyle – business was so hard. I was making tiny, incremental improvements. Working with him is like having a bulldozer behind me! Pushing me to improve, move, grow, and get better. Working with Kyle has made my life so much easier. I recently moved Josh to another Remodelers Circle group to keep him growing and learning. He went from ‘big fish’ in his previous Circle to ‘small fish’ in his new Circle, which will give him a lot more insight and clarity on how to continue to grow his business. Josh has a long-term goal of not being hands-on in his business so that he can use his building skills for mission’s work around the world. Our continued focus is on fine-tuning his sales process and Professional Services Agreement, strengthening his marketing plan and messaging on what makes him different, continuing to implement systems and processes that focus on him delegating more work to his growing team, all while maintaining very, very strong owner earnings and net profit.